New Stuff on DotSauce Magazine! Home > Advertising > New Stuff on DotSauce Magazine! Hello readers new and old! Thank you for your continued support of DotSauce Domain Magazine. I am writing this brief article to plug some of the latest additions to this website that you may or may not have noticed yet. Since the very first article was published DotSauce has not had a single advertisement displayed. I wanted to develop, promote and market the magazine for several months before I attempted to monetize it at all. Now with several hundred dedicated feed subscribers and thousands of unique visitors monthly I think it is time I get a little something for my work! Please see the Sponsorship information page for complete details on how you can advertise your product, service or website to thousands of domainers on a monthly basis. This offer is limited to only two sponsors per month and will be sold to the highest bidder. There are currently no takers yet–this could go for a steal during the month September! I am an active contributing member to the NamePros forum community and wanted to give something back to all the other members. I am providing a protected list of several hundred dot com domain names that are available to register to NamePros members only. 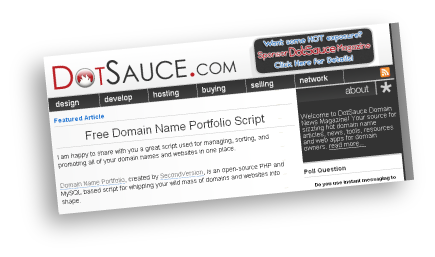 You can join NamePros for free and then get the details on accessing DotSauce’s Available Domain list at this thread. Free Site-wide SEO Friendly Links! I have just implemented tracking system for those loyal readers who feel the urge to have their voices heard by commenting on articles. If you glance a bit to your right you will see a section for the “Most Active Readers” in which those who comment the most get their link prominently displayed on every page! Thanks for your support, get started by commenting now! Feel free to grace our most active readers with a visit to their site. Each resource section (Design, Develop, Hosting, Buying, Selling, Network) has a new category entitled “Additional Articles” in which your article can be featured! If you write a blog related to the domain industry, web development, design, SEO or hosting please contact me about the possibility of linking directly to one of your articles. I am also looking for guest bloggers to write unique articles to be published solely on DotSauce Magazine. This can be a great way to get the word out that you are somebody in-the-know as credit will of course be given with a link to your blog.